Home Park welcomed the Jamaican-born, 6' 1" forward as the second loan signing in as many days - following Jordan Houghton from Chelsea - to bolster Argyle's strike-force after the news of Ryan Brunt's long-term injury. Starting his career with Sutton Coldfield Town, Matt moved to Kidderminster Harriers in November 2010, initially on non-contract terms, following an earlier trial with the National League side. He ended up staying for two years at Aggborough, although his time there was punctuated by visa and work permit issues. 22 goals in 62 games led to a new 18-month contract in January 2013. However, Fleetwood Town broke their club record transfer fee later that month to sign Matt for £300,000. He was ruled out for a month by an ankle problem in November 2013 and then missed the entire 2014–15 season due to injury, but was still offered a new contract in May 2015 to remain at Highbury Stadium. Matt arrived in Plymouth after 37 starts and a further 26 substitute appearances for the Cod Army, notching up 16 goals. He also had League Two experience after a two-month loan deal with Stevenage, where he scored once in eight games before returning to Highbury in January 2016. 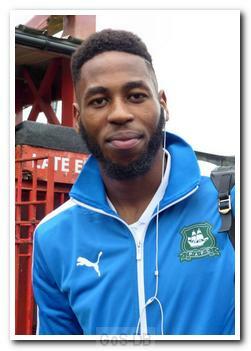 Whilst only playing 14 games in green, his seven-goal return was an important factor in the play-off push, his goals including an impressive brace against Portsmouth (one of which was an overhead kick) in the 2-2 draw at Fratton Park in the 2015-16 League Two play-off semi-final which ultimately helped take the club to Wembley. His last appearance for Argyle was a start in that ultimately disappointing afternoon in north London. Overtures were made to sign him permanently during the summer but he eventually elected to make the shorter move to neighbours Blackpool, and was warmly applauded by the Home Park faithful when appearing as a substitute for the Tangerines in March 2017.